Jojo, like Life cereal’s Mikey, doesn’t like a lot of foods… well, healthy foods, at least. I’m not making fun of him… he’d be the first person to admit it himself. So, when I find a veggie recipe that he will eat, nay, ENJOY, then I know it’s a good one. This recipe was introduced to me by our awesome friend Zach and is for the most delicious green bean recipe you’ll ever eat- and there is no crunchy, canned, fried-onions or cream of mushroom soup in sight! The official name for the recipe is, “Lemon-Roasted Green Beans with Marcona Almonds.” It comes from epicurious.com who, in turn, got it from Bon Appetit. Position 1 rack in top third and 1 rack in bottom third of oven and preheat to 450°F. Spray 2 large rimmed baking sheets with nonstick spray. 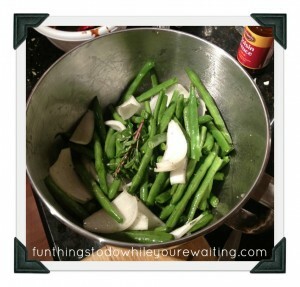 Combine green beans, onion wedges, and marjoram in large bowl. Drizzle with oil, then sprinkle with coarse kosher salt and pepper. Toss; divide between prepared sheets. Roast vegetables 15 minutes. Reverse sheets. Continue to roast until beans are tender and beginning to brown in spots, about 10 minutes longer. It’s super easy… though it requires two baking sheets (which isn’t really an extra clean-up problem when you use parchment paper instead of non-stick cooking spray that’s called for in the recipe.) As the recipe states above, you adjust the racks on your oven to the top and bottom and then I cover two baking sheets with the aforementioned parchment paper. Then, you just toss the green beans with the onion wedges, and marjoram (which if you don’t have marjoram, basil or thyme can be substituted.) Drizzle them with oil and sprinkle with salt and pepper. Divide the mixture in half onto the sheets and toss ’em in the oven for 15 minutes. After the 15 minutes, reverse the sheets in the oven (switch them top to bottom) and let them roast for another 10 minutes until you see things start to brown in spots. Take the beans out, put them in a bowl and toss them with the lemon juice, lemon zest (if you’re feeling schmancy) and half of the almonds- which you’ve already chopped at this point… should’ve mentioned that, huh? Side Note: For years, I couldn’t have told you what Marcona almonds were and had had this recipe with regular sliced almonds… which were excellent… but, let me tell ya… Marcona almonds are amazing. I first found them at Trader Joes, but have subsequently found them at our local grocery store. They are super-tender and have a rich, decadent flavor. 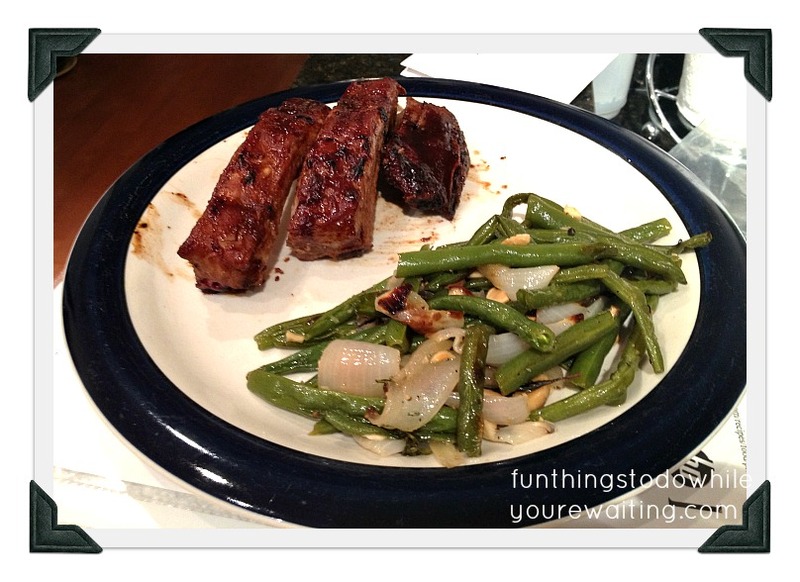 Plate your green beans (I served them with hoisin-glazed spare ribs) and sprinkle the remaining almonds over them for presentation. This side dish is so yummy you’ll never believe that it is good for you! 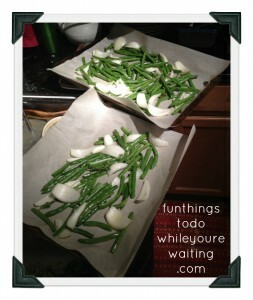 Not only are the green beans yummers, but the onions soak up the lemon juice and are just as awesome! This dish is a TOTAL win- a MUST try! If you do, as always, let us know! Pesto is the BESTO!!! How Do YOU Suh-Lahd? BEHOLD! THE MIGHTY SPAGHETTI SQUASH! Healthy, Side Dishes, What's Cookin'? 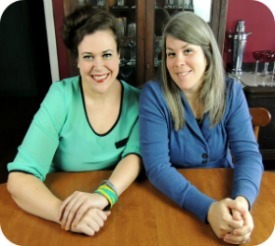 Healthy, Jojo, Leigh, Side Dishes, What's Cookin'? Previous Article← Live Music is one of the Funnest Things-Ever- To Do While you Wait! mmmm. I love green beans!!! Now, the hoisin-glazed spare ribs need to get up on my plate TODAY! yum. I loved these green beans so much when you made them for us! Thanks for sharing the recipe.